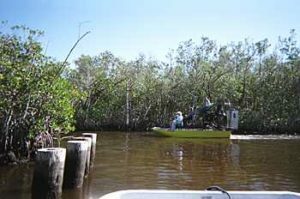 All commercial fishing is prohibited in Everglades National Park. Except for dip nets, cast nets, and landing nets, all other seines and nets are prohibited. The use and possession of spear guns and spear poles are prohibited. A Florida freshwater fishing license is required to fish in freshwater or to possess fresh water species. Bait- Live or dead fish (including minnows and shiners) or amphibians, and non-preserved fish eggs or roe, are prohibited. Digging for bait inside the park is not permitted. No fishing is allowed at the Ernest Coe Visitor Center lakes, Taylor Slough, Royal Palm Visitor Center area and trails, Chekika Lake and along the Shark Valley Tram Road.